You have the right to withdraw from this contract within 14 days without giving any reason. The withdrawal period will expire after 14 days from the day on which you acquire, or a third party other than the carrier and indicated by you acquires, physical possession of the goods.  To exercise the right of withdrawal, you must inform us (Checker Demon Press, Alarichstraße 21, 70469 Stuttgart, Germany, Phone: 0049 (711) 816286, Email: info@checker-demon-tattoos.de) of your decision to withdraw from this contract by an unequivocal statement (e.g. a letter sent by post, fax or e-mail). You may use the attached model withdrawal form, but it is not obligatory. To meet the withdrawal deadline, it is sufficient for you to send your communication concerning your exercise of the right of withdrawal before the withdrawal period has expired. – Contracts for the supply of goods that are made to the consumer’s specifications or are clearly personalised. – Contracts for the supply of sealed audio or sealed video recordings or sealed computer software which were unsealed after delivery. The guidance provided in this section (“Return instructions”) shall not be construed as a precondition for the effective exercise of the right of withdrawal. Customers are requested to notify the Seller of their intention to return the goods before sending the goods back to the Seller. This enables the Seller to track the goods quickly and efficiently.